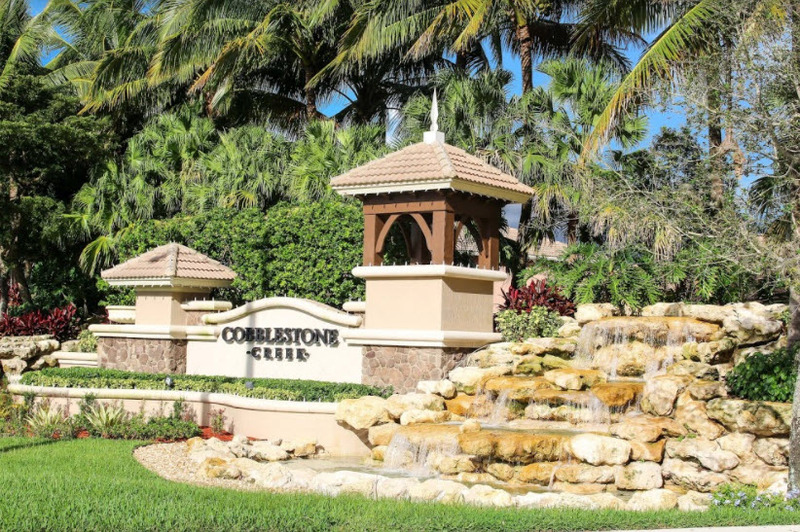 Cobblestone Creek is a beautiful resort-style community located in Boynton Beach, Florida. From the beautiful landscaping and scenery to the wonderful location and amenities, this community offers an unforgettable living experience. With eleven floor plans to choose from, there is something ideal for every buyer. Search all homes for sale, just like an agent. Our free, one step registration allows you to bookmark your favorite houses, save search and receive emails as soon as new homes in Cobblestone Creek come on the market. Residents of Cobblestone Creek are living a dream. Not only are there countless world-class amenities free to use at anytime, but residents are immersed in an atmosphere with beautiful greenery, blooming flowers, and gorgeous trees as soon as they drive through the grand entryway. There are amenities to for all residents. Cobblestone Creek has a resort-style pool, a fully equipped fitness center, walking trails, playgrounds, and a waterpark. The community promotes fitness and fun. Located on the northeast corner of Boynton Beach Boulevard and Lyons Road, Cobblestone Creek is just minutes away from malls, restaurants, entertainment facilities, recreational activities, and beautiful beaches. Are you thinking of selling? Please complete online interview to provide out team information about your home.